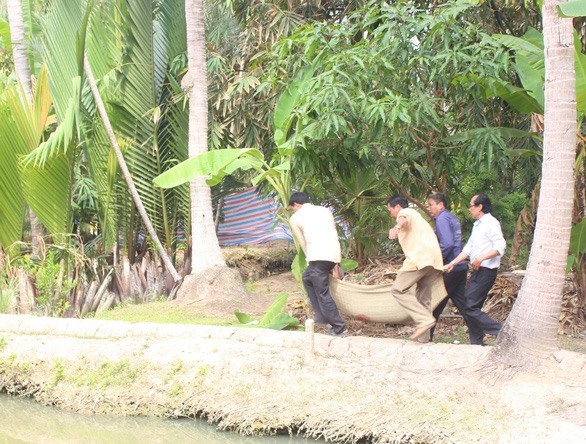 Two women were found dead early on Saturday morning at their duck-watching hut in Mỏ Cày Bắc District in the Mekong Delta province of Bến Tre after the husband of one woman confessed to the murders. Đặng Ngọc Mễ, 45, of Tân Phú Tây Commune, and Nguyễn Thị Ngọc Dung, 51, of Hoà Lộc Commune, who were best friends, had met to feed ducks in Tân Phú Tây Commune where the alleged murders took place. Last night, the two women joined a party at the home of a friend and then returned to their duck-watching hut to sleep. At 1am today, Mễ’s sons called their mother, but were unable to make contact. They went to the hut and discovered that their mother and her friend had been killed. At 2am, Mễ’s sons received a phone call from their father, Trần Thành Hồ, 45. He told them to go to Hàm Luông bridge to get his motorbike. When they arrived at Hàm Luông bridge, they found the motorbike but did not see their father. Hồ had jumped into the Hàm Luông river in an attempt at suicide, but he was saved by local residents after drifting onto the river bank.